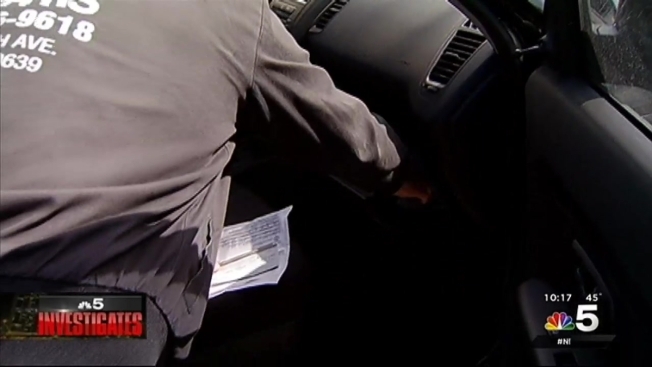 Personal documents left behind in vehicles that are sold for scrap continue to show up at Chicago area auto part lots, raising the risk of identity theft for the people who used to own the vehicles. Just ask Robin Rivera of Memphis. The hairstylist was on a recent trip to Chicago when another car T-boned her Kia Soul. “Wham! Spun me all the way around. Kind of knocked me senseless,” Rivera said. Rivera was not hurt. But the wreck totaled her car. She later met with a representative of her insurance company and the two cleaned out her Kia of personal belongings before it was sold at an auction. You may escape a bad car wreck with just a few bumps and bruises. But if your vehicle is a total wreck and gets sent to the junkyard to be sold for scrap, it may take a piece of you with it. NBC 5's Chris Coffey reports. Chicago used auto parts business owner John Catalano later bought the Kia at an auction. And when the car arrived at his lot, he opened the door and found several items that belonged to Rivera. “A checkbook, medical bills with date of birth and other personal information,” Catalano said. The documents are everything a thief would need to steal someone’s identity. Catalano said he’s seeing more and more personally-identifying information left behind in cars that wind up in his lot. “At least ten cars a month now we’re seeing this,” Catalano said. In fact, NBC 5 Investigates visited multiple Chicago area junkyards this summer and found social security information, drivers’ license numbers, tax forms and medical documents left behind in junked vehicles. “They (identity thieves) can then use all that information to either take out credit in your name or run other sorts of scams that will really put you in a financially perilous situation,” said Illinois Attorney General Lisa Madigan. Rivera can breathe easier, however. Catalano contacted her about the documents he found. He later destroyed them. “I’m thankful for John. I’m thankful that there are still honest people out there that are doing that, but it exposed something that I never would have thought of,” Rivera said. Rivera said even though she missed the sensitive documents while cleaning out her car, she expressed mixed feelings about it going through another set of hands at the auction and the documents still weren’t removed. “What about other people who couldn’t get back to their vehicles? That’s like a breeding ground. That’s unnerving,” Rivera said. A spokesperson for Insurance Auto Auctions (IAA) said many parties are involved in the transportation and movement of a wrecked vehicle prior to a vehicle arriving at a salvage auto auction. IAA said it works with customers to make sure all personal items get returned to their rightful owner. Still, IAA said insured persons involved in an accident should contact their insurer to understand and obtain direction as to the preservation and return of personal property and documents. Catalano and other auto recyclers said auctions usually do a good job of cleaning out cars. However, they said abandoned vehicles towed directly from city streets are usually not cleaned as thoroughly as vehicles coming from auctions.